17,630 high school students in East Jakarta take Computer-Based National Exam (UNBK) in 121 schools, Monday (4/9).
" 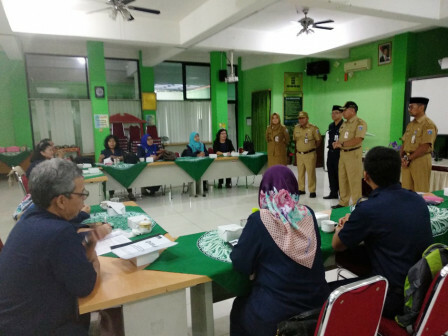 Generally UNBK is running smoothly because school has prepared it from the beginning"
East Jakarta Region 1 Education Sub-dept. Head, Muhammad Roji said, there are 66 schools hold High School UNBK in his area. It consists of 20 public schools and 46 private schools. "There are 8,613 high school UNBK participants in total," he informed. East Jakarta Region 2 Education Sub-dept. Head, Ahmad Rachem added, 55 schools in his region hold high school UNBK. It consists of 35 private schools and 20 public schools with total 9,017 students who take the exam. "There are three subjects tested in high school UNBK. We have reminded schools to prepare it from the beginning," he mentioned. His side has cooperated with PT. PLN and PT. Telkom to prevent power failure and internet network disruption during UNBK. Meanwhile, East Jakarta Mayor, Bambang Musyawardana reminded students to do their best in test. "Generally, UNBK is running smoothly because school has prepared it from the beginning. I hope student can be serious in taking test, don't be hurried, don't forget to pray and study," he affirmed.